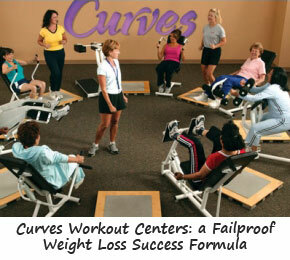 Curves Workout Centers: Your Failproof Weight Loss Success Formula? When should you consider a Curves workout centers membership? If you are a woman who likes to exercise in a group, Curves for women gym could be your best choice. Take a look at how things work at Curves and decide for yourself. In a nutshell, Curves weight loss centers provide you with a 30-minute 500-calorie burning, full body exercise program consisting of a mix of cardio and strength training on 13 different workout stations, which you hop in at any place in the circuit. At Curves for women gym you can participate in the exercise circuit whenever you want – take your 30 minutes before work, during lunch or after work. Don’t have much exercising experience? You’ll be pleasantly surprised to find out that Curves membership offers first-rate personalized coaching. This way you get the feedback you need to exercise properly, using a variety of stations for high-intensity exercising and low-intensity resting periods. To get the equivalent of a regular 90 minutes workout in just 30 minutes, burn 500 calories on the spot and work your muscles for further calorie burning up to 48 hours, Curves for women gym circuit uses the concept of high intensity interval training. The 13 exercising stations at Curves weight loss centers are set up to tone two of your muscle groups at a time – then, you move to the next station. Because it works different muscle groups at different times, each of your major muscle groups is getting an effective workout. This way, you boost your metabolism burning more body fat, build strong bones and protect your lean, muscle mass. I’m not a big fan of trying to lose weight going to the gym. But Curves is a bit different – here’s why. For the first part, Curves system gives you the right mix of cardio, strength training and high intensity interval training that has helped so many women like you lose the extra pounds and tone their bodies. For the second part – you know that in order to stick with an exercise routine, it has to be something you enjoy, right? Well, the Curves support network is essential – everybody knows the workout circuit and is happy to help out the newcomers, although the circuit is easy to follow and the exercises – easy to learn. Belonging to a Curves for women gym gains you a whole network of friends working out towards the same goal: healthy weight loss and shaping up. …a healthy lifestyle concept consisting of effective exercise, good nutrition and a supportive environment. If you are looking for a proven healthy weight loss solution, Curves for women gyms offer a comprehensive weight loss program in thousands of centers in 60 countries, so you must have one close to home.